Haribo makes some great chewy candies, but this is not one of them. 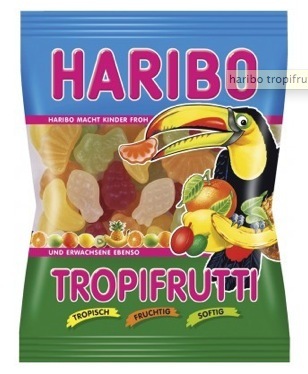 The fruit shaped candies taste artifical, and bland. I tried every flavor and then threw the bag away. Posted in chewy candy, Don't bother, Fruity and tagged chewy candies. Bookmark the permalink. Sorry to hear you hit a dud:( Can’t all be amazing, I guess. Am off to Costco today and have cashew coconutty things and caramels on my list. It’s actually a blessing in disquise…Enjoy Costco!